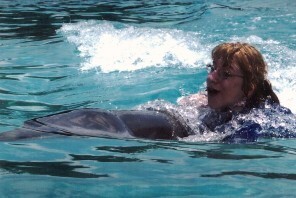 Chelsie experienced the first of two dolphin trips awarded in 2001. With her grandparents and her sister, Chelsie traveled to Discovery Cove at SeaWorld, Orlando, FL. As is evident in the photo, Chelsie enjoyed her trip, which included a swim with the dolphins! Words could never begin to be able to express our thanks for the wonderful trip to Florida. It was awesome from the time Jean met us at the airport in Martinsburg until we returned home. SeaWorld was our first adventure. We were there at 9AM to start the day. The shows were great. Of course Chelsie and Brittany had to be seated at the wet zone to be splashed by Shamu. And wet they did get. We were there for the entire day. The next morning we were up at 6AM down to breakfast. And may I add the Embassy Suites was beautiful. Now we are on the shuttle and off to Discovery Cove. This was a sight to behold; it was like being on a tropical island. We were greeted and walked down the path to get changed to swimwear. Chelsie and Brittany had the day of their LIVES! Everyone was so pleasant and helpful. I wish you could have seen Chelsie coming across the lake on the dolphin. Chelsie had the longest ride of anyone there. The name of the dolphin was CJ. I was a little scared when I saw how far it took her. But Chelsie said Hillary was with her and she was not afraid. This whole day was unbelievable. Then on Sunday we went to Universal Studios. Chelsie loves music. Well guess what? She had to go to the recording studio where she and Brittany sang and recorded a CD. And it really sounds pretty good. I could go on and on – we had a wonderful vacation. You certainly outdid yourselves to make this possible. And this is a time of Chelsie’s life and ours that we will never forget. Well I am going to close for now and thank you from the bottom of my heart.